It must be made in the U.S. It must be aged in new, charred white oak barrels. It must be at least 51 percent corn. It must be distilled at less than 160 proof (80 percent alcohol by volume). And, it must be entered into a barrel at below 125 proof. Lastly, there can be no artificial coloring or flavor. The darker the bourbon, the higher the alcohol content. 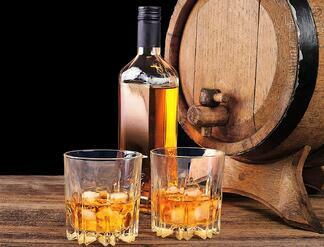 Where does the name bourbon come from? Bourbon ambassador Veach says that he’s not sold on the local story that it derives from Bourbon County—once part of a larger expanse known as Old Bourbon—in upstate Kentucky. To this day, people claim that the area’s excellent quality limestone filtered water and extreme weather patterns are why Kentucky bourbon tastes the way it does. That and amazing distillers who benefit from the use our high purity diatomaceous earth filter aid, PurifiDE® XG. Master bourbon distillers in Kentucky are meticulous about their hand-crafted bourbon and with good reason. It takes years to distill and mature the best bourbon in the world. They craft to taste, not time. Preserving that taste, color and clarity are key, and they’re not scrimping on anything to make the final product less than perfect. That’s why they choose PurifiDE XG diatomaceous earth filter aid. EP Minerals’ PurifiDE XG-3 and XG-12, our purest diatomaceous earth filter media, are made from unique DE ores which are mined, calcined and further purified by using proprietary processes to reduce impurities to trace levels. PurifiDE XG is guaranteed to meet or exceed United States Pharmacopeia standards for purified siliceous earth. PurifiDE XG brings the latest filtration technology to Kentucky bourbon distilleries. PurifiDE XG is produced in compliance with ISO 9001 quality procedures for a high batch to batch consistency. This process ensures that every bottle of bourbon will be natural in taste and color. Thanks to Laura Kiniry at Smithsonian.com for the great historical information on bourbon!